JOIN THE CLUB: Charter Club, designed in 1913 by Philadelphia architect Arthur Meigs, is among the palatial Princeton University eating clubs profiled in a new book by local author and historian Clifford Zink. Meigs was a member of Charter Club and the Class of 1903. Back in the mid-19th century when Princeton University was still called The College of New Jersey, undergraduates had a hard time finding a decent meal. This gastronomic inadequacy regularly sent students to local taverns and inns, much to the disapproval of faculty at Nassau Hall. It was this scenario that set the stage for the University’s eating clubs, the first of which — Ivy Club — was formed by students and alumni in 1879. The gracious, architecturally distinctive mansions that still line both sides of Prospect Avenue (and one on Washington Road) are the subject of The Princeton Eating Clubs, by local author and historian Clifford Zink. Recently published by the Princeton Prospect Foundation, the lavishly-illustrated book explores the early evolution of these organizations, their architectural heritage, and what makes them unique. Zink will speak about the book on Tuesday, December 12 at 7 p.m., at Princeton Public Library. Admission is free. The eating clubs are part of the Princeton Historic District, which was established in 1975 and consists of 64 buildings. 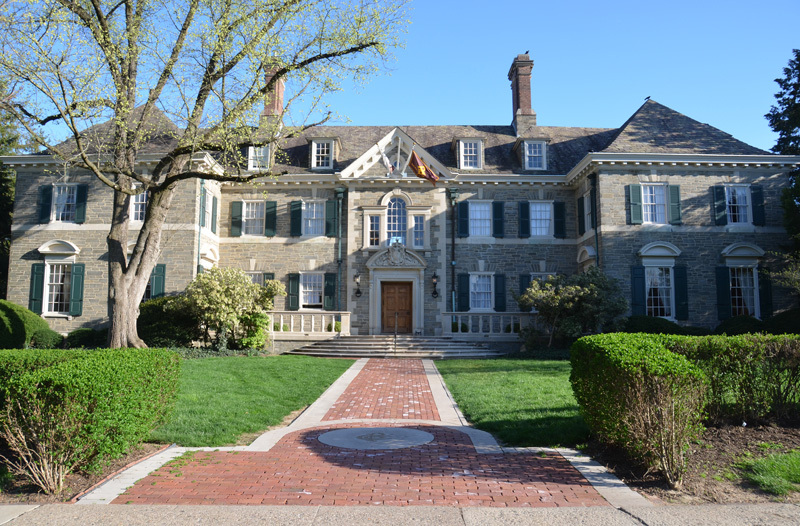 The Princeton Prospect Foundation is a charitable entity that oversees donations to the clubs from alumni to upgrade and protect their architectural integrity and historical significance. After the Foundation’s lawyers advised the PPF to strengthen its mission, the organization decided to focus specifically on preservation, historical significance, and educating the public about the clubs. Zink was retained to bolster documentation already on file with the New Jersey Register of Historic Places and the National Register of Historic Places. Harrison, a pension consultant who lives in Ardmore, Pa., served as chief editor and logistical coordinator (“by default,” he joked) for the project. He is pleased with the positive reviews he has heard since the book came out this fall. It took about eight months to complete the book. Zink took some of the photographs of the interiors and exteriors, and hired photographer Berge Parigian to shoot some others with a drone. More than 20 different eating clubs have been established at Princeton since 1879. There are currently 11, 10 of which are on Prospect Avenue. Terrace Club, of which Harrison was a member and chairman of its board of governors, is around the corner on Washington Road. It is the only club not built specifically for that purpose (it is in a former professor’s house). The clubs have been co-ed since the early 1990s. “That’s another book,” said Zink, who focused on architecture and design in The Princeton Eating Clubs. “They were all built between the 1890s and the turn of the century, which was the greatest period of growth and prosperity in American history,” he said. “That provided the financial resources.” A list of notable alumni is in each of the book’s club descriptions. Many of the clubs were designed by prominent architects of the period: McKim, Mead and White; Cope and Stewardson; and Raleigh Gildersleeve (who also designed Drumthwacket, now the New Jersey governor’s mansion). Zink pointed out that several contemporary local architects, including J. Robert Hillier (a Town Topics shareholder), Michael Mills, Michael Farewell, Michael Mostoller, and John Hatch, have done additions or renovations to the buildings.